Since February, I have been running a pilot program at my academic library that involves a series of maker events and workshops. As the library wasn’t able to designate any physical space as a full-time makerspace–nor do we have the staffing for it–this model made sense for us. Overall, the experience has been a really good one, and I have been encouraged to see the kind of response and interest we’ve gotten. Over the summer, I will be sitting down to fully evaluate how our pilot semester went, and will be determining what adjustments need to be made to the program for next fall. As a result, I’ve started to think about the lessons I’ve learned so far. Below (in no particular order) are the top 5 things my experience running our maker events program has taught me. 1. A maker events and/or workshops model is not well suited to long-term projects. Starting out, I had envisioned that at the end of the semester, I would hold some kind of Maker Showcase, where those who had been attending events could display projects they had been working on. I imagined students returning again and again to work with the same equipment as they built toward a final product. It wasn’t long before I discovered the realities of an event-based approach: attendance varied greatly and it was difficult for attendees to work on anything long-term when the equipment would need to stay with me and they couldn’t be sure of the next time they would have access to it. This is not to say that I think event-based models don’t work, just that they are a different approach from dedicated makerspaces and will result in different types of projects and experiences. 2. Maker events limit access to equipment. Again, I don’t regret choosing this approach for my maker program, and I was glad to start with something smaller and more manageable to roll things out. Along the way, though, I ran into numerous instances of patrons wanting more access to equipment than they got through a handful of two-hour events per month (there is a strong connection here to the first point about long-term projects). I had a number of students ask me to borrow supplies to take with them or if they could come by my office at some point to use certain tools. As a result, for next semester, I might look into how I can expand access while still staying within the confines of my limited space and staffing constraints. 3. Some partnerships are easy; some take work. I was lucky enough to be approached by faculty and staff I hadn’t met before who heard about the maker program and wanted to collaborate. On the other hand, I had originally planned to bring in more faculty, staff, and students from around campus to help provide guidance and share their expertise during events and workshops. In this, I struggled a bit to find volunteers. 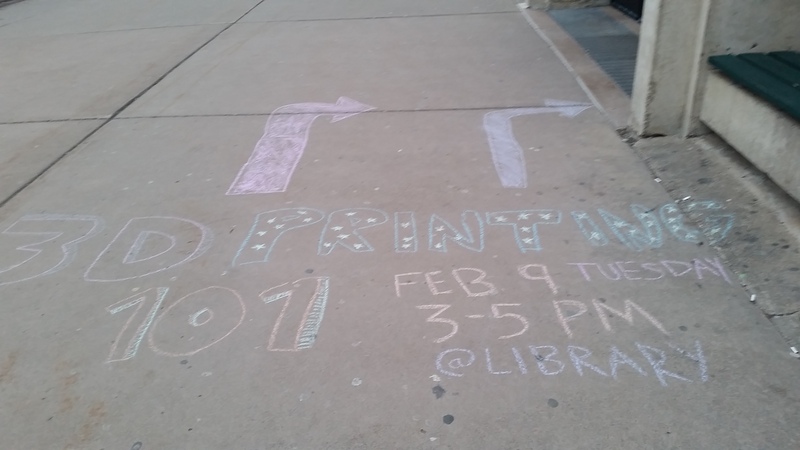 I did notice, however, that the more I talk about the library’s maker events and the more I share information with others on campus, the more people seem to emerge who are interested in finding ways to work together. I think building up partnerships and strong collaborations is a process, but a worthy one. 4. I didn’t need as much stuff as I thought I did. When initially building up the program, I was able to secure a grant from the university to buy a bunch of equipment. The library contributed some additional funding to further round out our maker supplies. As a result, I ended up with quite a collection. I actually worried at first that I wouldn’t have enough tools or enough variety in the tools I was providing. I am happy to say I was wrong in this. In fact, there are even some tools that have been largely underutilized. Next semester, I hope to plan themed events to showcase some of these overlooked supplies, but I think there is also a valuable lesson here: you really don’t need a lot of tools to have a makerspace. 5. People will be awesome. Starting a completely new program can be intimidating. I worried: Will people care? Will people come to my events? I thought I would need to find ways to encourage attendance, skill sharing, and enthusiasm. I thought I might need to come up with challenges for people to complete to help get them going exploring the maker equipment. Bottom line: I didn’t. People came, people were interested, people were excited. I found out there were people on campus who already knew about things like Arduino or crochet, and were eager to show others how it worked. If you design your maker events around your community and with their interests in mind, it will work. There are people out there who care, and those people will be there. Have you started a maker events program? What was your experience like and what did you learn? Share your thoughts in the comments below or tweet at us @makerbridge!